Scratch Forums / I need a Minigame idea! » I need a Minigame idea! I need a Minigame idea! 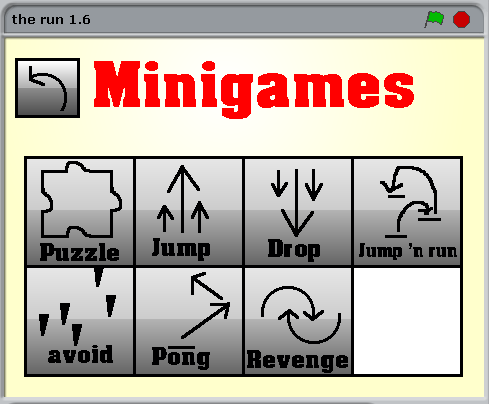 So I made this game called "The run"
It now has lots of new features, including minigames. Those are little extra games wich you can unlock. I already made 7, but I ran out of ideas. If you have any more ideas, please respond! Re: I need a Minigame idea! A minigame of remember the order of the pressed buttons… The CPU lightens buttons ina certain order, and the player have to press the buttons in that order. What about a simple maze? Or a simple game where you shoot an enemy? What about a scrollbar or a next page button so you can add more? Yes you're right, I think that's the best solution!